Spiti Valley in Himachal Pradesh is famed for its stark, barren landscapes, exquisite natural beauty and iconic cultural heritage. Travellers from all over the world flock to Spiti valley to bask in the glorious natural wonders; indulge in delicious cuisine; and partake in glorious adventure sports. It is natural to bring back some souvenirs from such a place so that you can fondly remember your trip. Friends and family too will expect gifts, or you can expect to return to a warzone! Fortunately for you, Spiti Valley and in fact, the whole of Himachal Pradesh is renowned for its splendid handicrafts industry. When you think about shopping in Spiti valley, items like Tibetan artifacts, woolens, clothing, woodwork, paintings, jewellery, food items will take precedence but these are only the tip of the iceberg. Prepare to be astonished at the sheer range of items you can shop in Spiti Valley! Fortunately enough, your entire journey on Spiti Circuit will take you through some very well known tourist destinations like Shimla, Kaza and Manali. These towns work like tourist magnets and people continue to visit here all year long. In places like Manali, there is never off-season to be honest and as a direct result, you have plenty of options to chose from when thinking about what to bring back home. The type of items to buy too will be different between the areas around Shimla, Spiti and Manali. Local Warm Socks, Sweater, Shawl, Rosted Barle, Dry Cheese, Barle Powder, Sea Buckthorn Tea are some of the most common items that are bought by tourists in Spiti Valley. But the list just does not end here. It is merely the beginning. 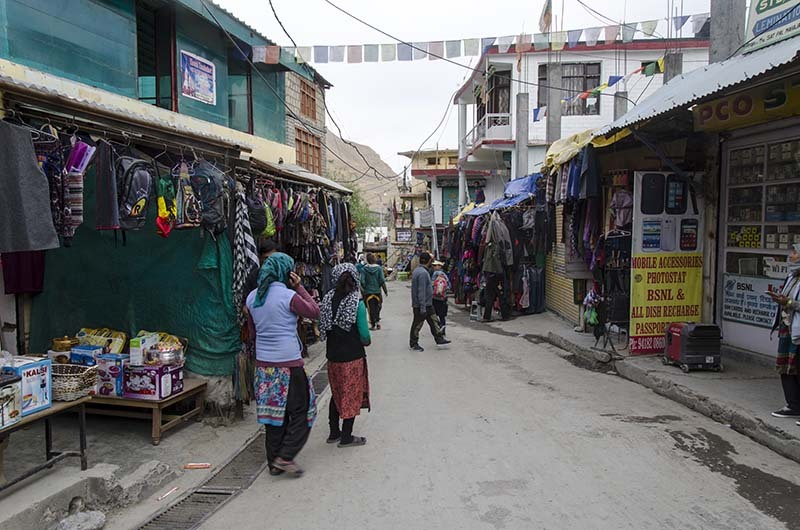 Let’s have a look at options for shopping in Spiti Valley. For ease of writing and understanding, I have broken the information below in categories and then listed down items that you can buy in that category. Objet d’art: Prayer wheels, flags, beads, masks, carved Chhang pots of brass or copper, bamboo baby cradles and work baskets. Choktse: Beautifully carved wooden tables painted in stunning colours or varnished to perfection. Buddha statues: Of differing sizes, and each significant in its own way, these statues of the Buddha and Guru Padmasambhava are exquisitely sculpted. Singing bowls: Crafted from copper and brass and carved intricately, these bowls are rumoured to have healing powers when they are sounded. Spiti valley shopping holds innumerable charming treasures, perfect for even the most discriminating traveller. Tibetan traditional dress, smart jackets, intricate stoles, Pashmina shawls and sweaters, vibrant skirts and multicolored Kinnauri Jootis and Topis are only some of the products on offer. These awesome garments will be a precious addition to your wardrobe, provided you can carry them off! Delve into the myriad local shops and remember to have time to spare! White and cream colored shawls are embroidered with traditional Kashmiri designs. Your whole body will be draped in vivid flowers, fruits and birds. These shawls are sophisticated and elegant at once! Patterned with geometric designs, each of these gorgeous shawls are rich in religious significance. The colours are inspired by the five elements: yellow for earth, blue for water, green for nature, red for fire and white for air. The perfect item to make a fashion statement! Traditional jewellery of Spiti Valley have one extraordinary aspect: a seasoned eye can look at a piece and spot which ethnic tribe fashioned it. Made with silver and studded with precious stones, they may also include handmade beads. These are exquisite collectors’ items and are both high on quality as well as class. Available here is a treasure trove of amulets, anklets, bangles, rings and neck-pieces in Tibetan and Pahari tribal styles. The names themselves sound so exotic and mysterious: Chalai, Ghunghroomala, Mendukmala, Nathni, Sikkamala, Kangnu, Chandrahar, BichwasToora, Boomani and Guthi. Just make sure you don’t get carried away by temptation and end up spending everything! Spiti has some of the best woolen works anywhere in North India and saris, caps, pyjamas, trousers and even bed-sheets are common. The most famous products are of course made with the unmatched Pashmina wool. You can also find garments and slippers made with homespun yak’s wool. The indigenous weavers are skilled at weaving superb baskets of dry grass and bamboo. Etched on these speciality items are designs depicting flowers, birds and trees. These eye-catching, intricately painted are perfect for hanging on the wall. Gazing at these lulls your mind into a tranquil state, helpful to meditate in. These sacred objects are made of silk or cotton and depict the Gurus or a scene from the Buddhist legends. Today an endangered art, these paintings depict mythological legends, gallant war heroes (think Mahabharata) and beautiful women. They are painted with organic colours only. Make sure to acquire these exemplary miniatures and support a dying art form. While shopping in Spiti Valley, you will surely come across classical rugs and carpets which reflect the rich traditions of the region. These rugs and carpets are used to provide extra insulation in the bone-chilling weather and are draped across floors and walls of homes and shops. While woolen rugs are common, look carefully and you will also find silky smooth blankets made from fine sheep fleece. You will be spoiled for choice in terms of designs and colours. The most popular motifs depicted on these carpets and rugs are that of the mighty Garuda, fully bloomed lotus flowers, lush green trees and flutes. Authentic Kashmiri carpets are also found here because a number of artists from Kashmir migrated here to escape political instability in the neighboring state. These indescribably lovely carpets are hand embroidered with geometric patterns and flowers. Prices depend on the material used. For example, fine lamb wool will cost more than beaten goat wool. Purchase one of these luxurious carpets and rugs to add a regal touch to your home! Charming, old-world traditions are reflected in these stunning wood carvings. The local craftsmen have perfected the techniques over countless generations, and it shows! Wood from walnut, mulberry, fig and chestnut trees are carved to impeccable glossiness and texture. The products are of a wide variety: bedsteads, settees, ladles, boxes of all dimensions, cradles, beer mugs, toys and even rosary beads. Most travellers are on a constant lookout to spot their ideal embroidered item, which are iconic of Himachal Pradesh. In Spiti, you will find the markets bustling with gorgeous embroidered products: handkerchiefs, bed sheets, shawls, kurtas, coverlets, caps and hand fans. Make sure you get your very own heavenly creation! Small handheld sculptures, or human-sized statutes, you will be sure to find sublime, opulent stone works the Spiti markets. Spiti Valley boasts a centuries-old metalwork tradition. Brass, copper, silver and gold, the craftsmen here are adept at bringing lifeless metal to full, blooming life. You can purchase incredible objet d’art here to decorate your home. These metal items are also perfect gifts to bring back a taste of Himachal Pradesh for your friends and family. You can pick and choose a variety of items: bells, low settees, flasks, lamps, burners, canopies, incense burners, utensils, statues and candlesticks. Himachal Pradesh leads the country in producing organic foods. Its proximity to the Himalayas also makes it the ideal market to source rare herbs and spices which provide untold benefits. Get ready to be tempted by the mouth-watering variety of food items for sale. All these fruits are converted into delicious jams, jellies, marmalades and compotes. Some of the most unique flavors can be found here such as peach, apple, nectarine, gooseberry and black currant. For an exciting drink with friends back home, you can purchase amazing blackberry rum! Kaza is one of the largest towns in the entire Spiti Valley. It’s market area easily stands out as the best place to locate a large variety of artifacts in one place. Many of these make ideal gifts and souvenirs. Stocked full of Tibetan and Buddhist wares, you can find bowls, wheels and prayer flags. One of the most unique items you can find here are items made of human skulls and thigh bones. These are of great spiritual significance and are equally used by Buddhist and Shamanist monks here. They are filigreed with silver and gold work and these intricate, precious items are a rare find. Apart from these, Kaza is also the prime place to purchase your very own Spiti T-shirts, which you can wear when you become nostalgic about your trip. Apart from Kaza, Shimla and Manali are the two next best places to go shopping. The variety of items that you will find in these two towns will actually be greater than even Kaza. If you are purchasing precious jewellery; like silver, pearls or turquoise; make sure you check the hallmark. Cheap Chinese made fakes sneak into the stock now and then. Most shopkeepers in these remote areas accept cash only. Also, ATM machines are not only rare but are frequently out of cash. Make sure you carry enough cash for the duration of your trip and keep some aside for shopping. Considering how remote these valleys are; it is truly a miracle that such a wide variety of handicrafts are available here. Shopping in Spiti Valley is a must for every traveller; and each lovingly collected item will bring back fond memories of this magical place. I hope the information above was of help. If you have any questions; or need any other information; please feel free to ask in the comments section below; or at our Community Forum; and I will be glad to answer. India - of chaos and method, colors and starkness, heaven and hell. Me? Forever fascinated. Your post is really illuminating. Will you please indicate approximately how much cash one needs to carry just for food and shopping?